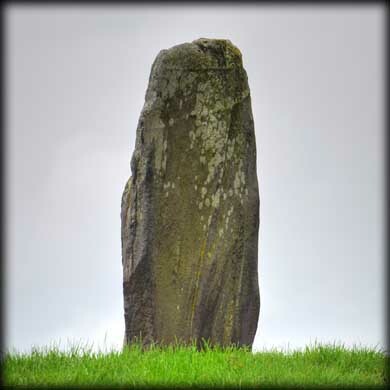 On the way back from Dungiven Priory I could see this handsome stone proudly standing on a natural hummock. On closer inspection you could see where the area around the stone had been built up to form a platform. Excavations have shown this platform may have supported a wooden fence that enclosed this fine monolith. The stone is 2 metres high, just over a metre wide and orientated east west along its width. The image below, showing the south face, was taken from the entrance to the priory with a zoom lens. I could not wait to get a closer view. You can see the stone and the entrance gate to the field at the start of the track that leads down to the Priory. Another way to see the stone is to walk up to the top of the graveyard behind St Patrick's RC church in Dungiven town. But this might involve scaling the fence. 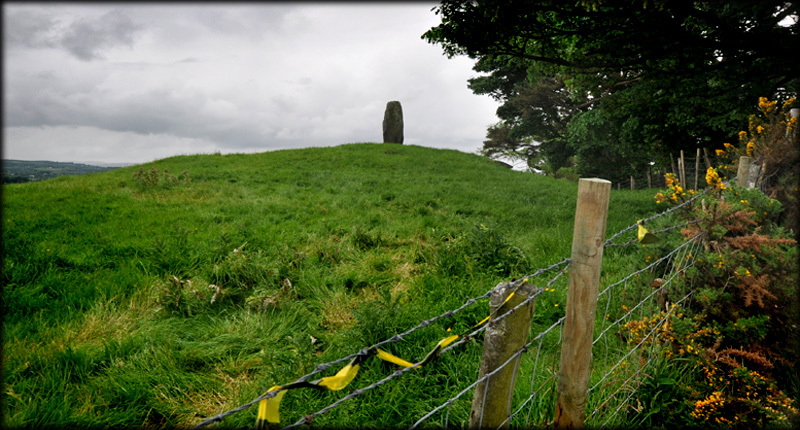 Situated: In a field behind the graveyard at the back of St Patrick's R C Church on the Main Street in Dungiven. Discoverer Map 7: C 6936 0845. Last visit June 2013.